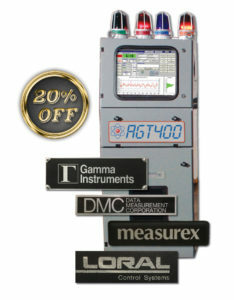 Advanced Gauging Technologies is celebrating the 20th anniversary of their first thickness gauge commissioning by offering a unique, limited time opportunity. Receive 20% off all parts on a “Tune-Up” for older A.G.T. gauges or a complete “Gauge Upgrade” for obsolete gauges. Tune-Up you existing A.G.T. gauge’s older electronic components with new State-of-the-Art replacements. Upgrade your obsolete isotope gauges from Gamma Instruments, DMC, Loral, Weston and more with all new AGT400 electronics and S.P.C. coil reporting system. Virtually all our original AGT400 gauges are still performing as designed. With the “Tune-Up” and “Upgrade” specials, you can be confident your gauge will still be working 20 years from now. Valid for purchase orders received by August 17th, 2018.